Ricardo Yepes Geron loves sea turtles — so much so that he decided to dedicate his life to saving them from extinction. 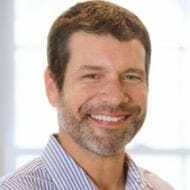 Ricardo serves as director of Fundación Yepez AC — a nonprofit foundation his parents founded to preserve sea turtles and their ecosystem. To spread the word about his foundation’s efforts, Ricardo knew he would need a solid website with a professional look. And he found the answer in one of Weebly’s many themes. “Weebly allowed us to create a professional, beautiful, and functional website in a very short time,” Ricardo said. Whether you’re a turtle lover, like Ricardo, or an entrepreneur looking to broadcast your business online, Weebly has a host of themes to suit your needs. Here, we’ll take a look at 12 of the best. For more than a decade, Weebly has allowed more than 40 million people to easily set up business and personal sites online. The web builder provides a wide array of compelling themes for its users, and the good news is most of them are offered for free as part of Weebly’s basic plans. Site owners have a lot to choose from when looking to set up a Weebly site. There are free designs to complement pretty much any subject area. Template.net recently highlighted the many features included in a number of Weebly’s free themes, giving a pretty good view into what Weebly has to offer. Our aim is to break down some of the best features of what we found to be the top three free themes. Don’t let the cost fool you — these designs are stunning and provide you with complete control over your content. If you’re looking to start an eCommerce site with a bit of flair, Haberdasher might be the theme for you. Haberdasher sites are easily navigable so your customers can browse through merchandise or directly search for specific products. Haberdasher offers online merchants a fully functional eCommerce theme. Carrying a black and gold palette, Haberdasher brings a refined look to your storefront. No matter what you’re selling, the theme gives shoppers a glimpse into your merchandise through large, full-width header graphics, sleek product galleries, and effective sidebar descriptors. Haberdasher is mobile responsive and has top search and navigational bars. The theme also includes vector social icons, allowing users to further the reach of their site on all the popular social media platforms. Weebly’s Slick theme lives up to its name, providing a stylized layout that lends itself to large imagery and bold text. 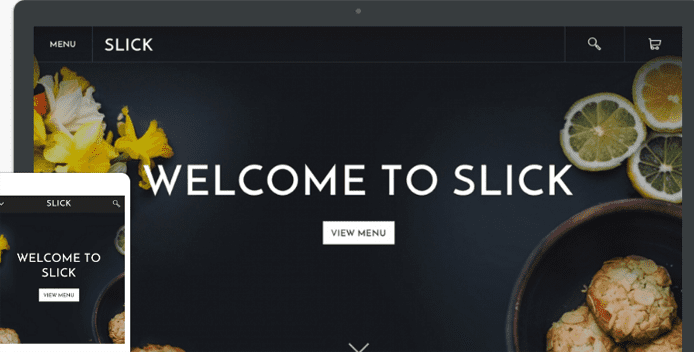 Slick accomplishes what every site owner wants — good first impressions through professional design. Weebly’s Slick theme provides versatility and can be employed for a number of industries. This theme is versatile and allows users to customize the feel depending on how they want visitors to approach content. Some sites, like Chicks and Cheese, employ Slick for a blog-type layout. Others, such as The Priest Movie, use Slick’s backdrop to house a large background image and overlay content on top to focus the viewer’s eye. Slick is easily navigable and includes a fluid scrolling functionality to keep visitors’ eyes on the content you want them to absorb. The theme has beautiful color palettes and is fully responsive. A good match for online businesses, CleanLines provides a universal theme with classic appeal. Another aptly named theme, CleanLines presents visual elements with precision. CleanLines offers a visually stunning layout utilizing full-width headers to create a streamlined feel. The theme’s full-width headers and minimalistic body give your site a sophisticated look to create an impact on visitors. CleanLines is fully customizable and offers entrepreneurs a blank slate on which to build their branding. CleanLines gives site owners three separate sets of black and white palettes to design sites their way. Like all the new Weebly themes, CleanLines is mobile responsive and can be tailored to fit your content. While Weebly’s free themes provide site owners with compelling, professionally designed templates, there are themes built through Weebly’s developer tools that some web designers offer at a premium. These themes are not housed on Weebly but are distributed by the developers as zipped files to users who can then incorporate them into their sites. Baamboo Studio and Luminous Themes are two of the top design houses specializing in providing Weebly users with these custom themes. Let’s take a look at some of their best work. Baamboo Studio’s Infiniti theme gives users the ability to set up their sites exactly as they envision them. The theme comes complete with four customizable menu styles, flexible color options, and 11 different page layouts. Infiniti’s slide-out search bar gives users a unique way to navigate sites. The theme’s hover styling artfully displays thumbnail captions, lightboxes, and other content on hover. And, with one-click installation, it’s easy to get up and running. Infiniti will set you back $40, but, when you look at what you’d be saving on add-ons and other features, it could be worth the extra cash. The menu styles and page layouts that come with Infiniti normally run in the $80 neighborhood. Another marriage of art and professionalism, Baamboo Studio’s Craft theme provides an effective design for businesses to showcase their message and products. The theme is bold, giving site owners the ability to display full-screen, high-resolution imagery. Craft was created with the goal of keeping visitors engaged with a site’s content. Like other Weebly themes, there is no coding knowledge required to get going with Craft. With a drag-and-drop environment, the theme is easily customizable. The Baamboo Studio team also provides fast customer support, so users running into snags can quickly get the help they need to keep their site design process running smoothly. Craft runs $33 — a seemingly reasonable price to pay for a theme designed to keep visitors engaged with your content. 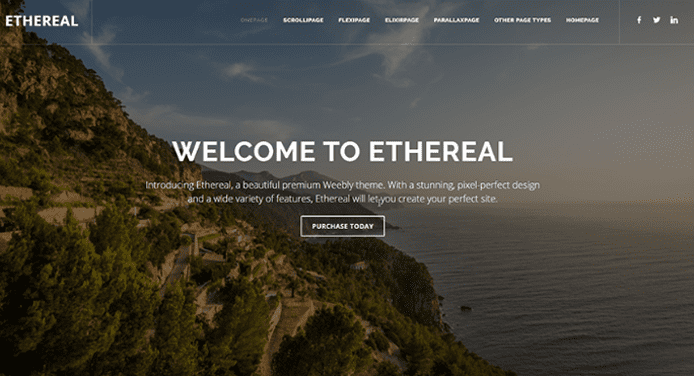 Luminous Themes created Weebly’s overall best-selling theme in Ethereal. 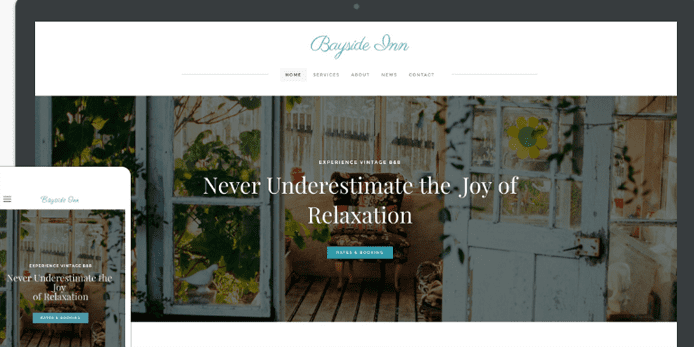 This multi-purpose theme employs features, such as parallax effects, gorgeous design, and specialty pages, that provide unique visitor experiences. With parallax effects and specialty pages, it’s easy to see why Ethereal is Weebly’s best-selling theme. The theme is high-quality, retina-enabled, and mobile responsive. With the $39 purchase of Ethereal, Luminous Themes gives detailed instructions on editing its contents, making setup easy and quick. Designed to create a modern feel, Ethereal puts your content, products, or portfolio front and center. The theme also gives the ability to add video backgrounds to any header without the need to code. One reason so many people are turning to Weebly to build their sites is the versatility of its themes. For those wanting to set up online stores, Weebly’s eCommerce themes provide seamless customer experiences that drive conversions. If you’re a photographer looking to showcase your portfolio, Weebly’s photography-based themes offer effective galleries to display your work. From blogs to restaurants, there’s a Weebly theme customizable to any industry. Whether it’s for business or pleasure, Weebly’s themes can get your message out in a way that meets your specific needs. With the launch of Unite in 2015, the company announced all Weebly themes would be responsive going forward, which would create consistent experiences for visitors using any device. True to its name, Unite blends classic web design with a contemporary feature set. Weebly announced all of its themes would be responsive after the launch of Unite in 2015. Lifestyle, blog, and eCommerce site owners all find Unite’s gallery hover an effective means by which to present content. The top of each page offers fixed navigation, making it easy for visitors to find what they’re looking for. With an integrated storefront, blog options, and versatile pages, site owners can customize Unite in a number of ways. If you’re looking for other Weebly responsive themes, there is no shortage. Website Builder Insider recently released a list of Weebly’s top responsive templates. Website creation can be stressful for photographers. Not only do they need to present professionally designed sites for their clients, but they also have to showcase their work in a way that complements their art. This can be a tall order for those with little to no coding experience. Cento provides a minimalistic backdrop so photographers can put the spotlight on their art. Thankfully, Weebly provides a number of photography-based themes, and Cento tops the list. Cento provides a sparse backdrop that pushes your portfolio into the foreground. This allows your work to shine so clients can view it without distraction. The theme gives the option to remove sidebars from blog pages, which centers and highlights content. With a responsive design, boxed header, and fixed navigation, Cento is a great fit for creatives wanting to broadcast their art to the world. When looking for restaurant information online, diners usually want to know the specifics — what’s on the menu, when it’s open, and what the food looks like. Weebly’s Birdseye 2 theme delivers on all of these items. Restauranteurs can highlight their menus and star dishes and take reservations with Weebly’s Birdseye theme. Restaurateurs can highlight their star dish with a large editorial photo splashed across their homepage. As visitors scroll a Birdseye-themed site, navigation elements follow them down the page, making it easy to dive into the site’s different sections. The site’s blog layout lends itself nicely to compelling menu creation, allowing the addition of photos to entice diners to your establishment. With buttons giving visitors the ability to make reservations and animation capabilities to bring your dishes to life, Birdseye will have your visitors’ mouths watering in anticipation of their upcoming culinary experience. Creative bloggers who want to blast their content to the masses can put their ideas down on Paper — one of Weebly’s top blogging themes. The layout is reminiscent of black and white typography and follows an aesthetic akin to popular consumer publications. Bloggers can effectively broadcast their messages to the masses using Weebly’s Paper theme. Paper provides light and dark color palettes allowing site owners to incorporate the right feel on the right pages. If you’re selling products in addition to blogging, Paper’s eCommerce functionalities offer seamless navigation through products. Also included are CSS buttons, full-width header images, and fixed and collapsible navigational capabilities. And the hover effect included in Paper’s product galleries work to make your merchandise stand out. If you want to sell merchandise on your Weebly site, you should probably switch to its Squared 2 theme if you’re not already employing it. The theme is styled in a way that makes an immediate impression on shoppers with large featured images and compelling product galleries. Businesses looking for an eCommerce solution can find it in Weebly’s Squared theme. Squared puts product images front and center in a storefront that gives them space to breathe. With side navigation and the ability to quickly add buttons that lead to specific pages, your customers will easily find the products they’re looking for. Squared’s flexible color palettes give site owners the ability to customize their site according to their brands. And, its responsive design lets customers shop wherever they are. For job hunters or entrepreneurs looking to make an impression on prospective employers or clients, Weebly’s Journey theme provides a minimalistic canvas with sophisticated appeal. Journey’s design is sleek and presents content in a way that moves the eye across the important information on the page. Weebly’s Journey theme presents your content in its best light so you can impress prospective employers or clients. The fixed and top navigation functionalities on Journey help site visitors access the content from wherever they are on the site. This works especially well for sites with numerous pages. Weebly’s drag-and-drop environment makes it simple to create portfolio galleries on Journey. These galleries and the theme’s blog pages carry an aesthetic that’s sure to impress visitors. No matter the theme you decide on, Weebly makes it easy for you to customize your site based on your mission. Ricardo Yepes found this to be the case when he set up his site with the goal of sea turtle conservation. With Weebly, Ricardo was able to employ a beautiful theme and mold it into a solid website that matched his foundation’s brand. Whether you’re saving turtles, promoting your restaurant, or showcasing photography, Weebly has a theme that’s right for you.